The following plan provides a record of the 1882 occupation of the commercial sector of the township of Casterton, on the Glenelg River in south-west Victoria, Australia. 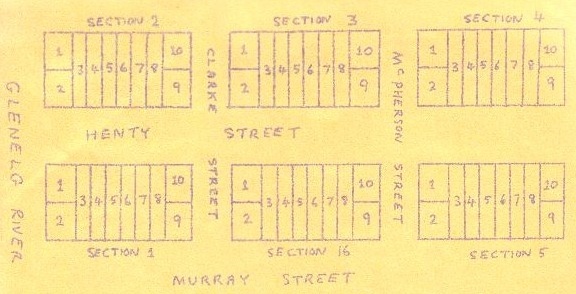 The main bridge over the Glenelg River at the bottom of Henty Street is on the left of the plan below. Looking for any stories about the businesses or individals named on this 1882 plan. This information will be linked to the names as shown in a few cases at this time. 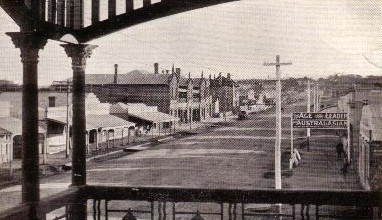 View of Henty Street Casterton (looking west), ca 1900. Grants Albion Hotel is the first large building on the left. Photograph is taken from the north side of Henty Street (Section 1) on the above plan.